Operators: Ermolaev L., Izvekov V., Lovkov V., Maksimov L., Sysoev V., Filatov I. On political developments in 1990: 28 Congress of the CPSU (Communist Party), meetings, national movement. 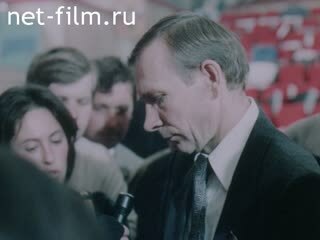 The film is about the socio-political movement in the Soviet Union before the collapse of the Soviet Union. The film presents the following motion picture: interview with the leader of the Communist Party Russian Nina Andreeva (synchronously). General view of the Lenin memorial in Ulyanovsk, meeting in Ulyanovsk Regional Party Committee, newsreel footage of Lenin's funeral in 1924, the performance (synchronously) of one of KVN (KVN), a view of one of the meetings in Tbilisi, the discussion of the Constitution of Georgia (synchronous), the types of Tbilisi and Gori, interview customers at empty shelves in stores, by the Secretary of the CPSU Central Committee Alexander Yakovlev (synchronously), Eduard Shevardnadze (synchronously), Mikhail Gorbachev, EK Ligachev (synchronously), Anatoly Sobchak (synchronous), N. Travkin (synchronous), G. Kasparov, Boris Yeltsin at the Congress of People's Deputies, meeting. Said the young man (synchronous) - CU., PNRM. The man says (synchronously) - CU., PNRM. Lenin's Mausoleum - LS., MS., CU. Says the Chairman of the Political Andreev (synchronous) - CU. Storefront, the bust of Stalin - MS., PNRM. Dancing legless boy - MS., PNRM., LS. Lenin memorial in Ulyanovsk - MS., PNRM. Lenin memorial in Ulyanovsk - MS., Hitting. Meeting in Ulyanovsk - LS. Tower Heist (synchronous) - MS., PNRM. Monument to Lenin - LS. Guys with slogans - MS., PNRM. Monument to Lenin - MS. (Shot with us), the Palace Square in Leningrad - MS.
Lenin's funeral - MS., PNRM. NK CU.upskaya - CU., Stalin and the other at the tomb of Lenin - MS., PNRM. People come out of the Lenin Mausoleum - MS., PNRM. Membership cards - MS., PNRM. Wooden Lenin Mausoleum - LS. Stand Stalin, Mikhail Kalinin and others - MS., CU. Saxophone, singing ensemble members of KVN (synchronous) - CU., PNRM., MS., Hitting. Rally in Tbilisi - LS., PNRM. The old woman, PNRM. the old woman in the tomb - CU. A girl lights candles - CU., PNRM. The old man - CU. Speaker (synchronously) - LS., PNRM. Said the leader of the Party of National Independence of Georgia V. Mtavrishvili (synchronous) - MS., PNRM., Hitting. A copy of the Constitution of Georgia - CU. Says V. Mtavrishvili (synchronous) - CU. Putting the organization - LS., Impact, departure. Performs First Secretary of the Communist Party of Georgia G. Gumbaridze (snihronno) - CU., LS., PNRM. Monument to Lenin - CU., MS., PNRM. Animation: Tbilisi, area without Lenin monument - MS.
Memorial Stalin - MS., CU., PNRM., LS. Stalin was alive - CU. Stalin and his associates - CU., PNRM. Stalin comes out of the Mausoleum - LS., MS.
Stalin is a mausoleum - CU. 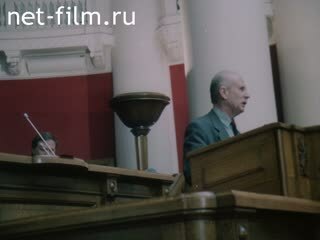 General Secretary of the Central Committee of the CPSU and the first president of the USSR Mikhail Gorbachev in the presidium of the congress - CU. Andreev says (synchronously) - CU., PNRM. Stalin with farmers - MS., CU. Stalin and Voroshilov - CU., MS. Steam locomotive - MS., CU. The inscription "Stalin» - MS. Portrait of Stalin - CU., MS. Portrait of Stalin - MS., CU. Bread and salt - MS.
Stalin with delegates - MS.
Acts Fortunatov (synchronous) - MS.
Acts Andreev (synchronous) - MS., PNRM. Another speaker (synchronous) - CU., PNRM. Countertop Store - MS., PNRM. Said the old lady (synchronous) - CU., Leaving and hitting. Says another old (synchronous) - CU. Kazan Cathedral - CU., PNRM. Singing - LS., PNRM., MS.
Kazan Cathedral - MS., PNRM. Acts deputy Alexander Yakovlev (synchronous) - MS. Speech frames AN Yakovlev alternate with shots listeners. MP stands AA Sergeev (synchronous) - CU., MS., PNRM. Speech frames Sergeeva alternate with shots listeners. 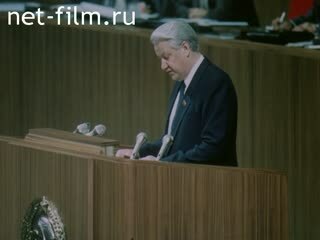 People favor USSR Supreme Soviet deputy and Foreign Minister E. Shevardnadze (synchronous) - MS., PNRM. and impact. E. Shevardnadze performance footage interspersed with shots listeners. 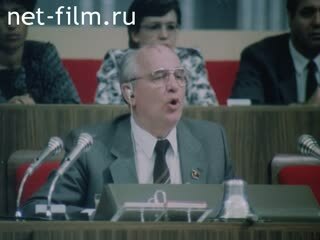 Gorbachev says (synchronously) - MS.
Gorbachev's speech footage interspersed with shots listeners. Said a member of the Central Committee of the CPSU AV Buzgalin (synchronous) - MS.
Mikhail Gorbachev listens - CU. Says A. Buzgalin (synchronous) - MS.
Gorbachev says (synchronously) - CU. The speaker from the microphone (synchronous) - MS.
Greet members of the government - MS.
Government members rise to the mausoleum - LS., MS ..
People buy newspapers - MS., PNRM. NV Ivanov says (synchronously) - CU., Departure, impact. Secretary of the CPSU stands EK Ligachev (synchronous) - CU. People's Deputy Anatoly Sobchak - MS.
Says A. Sobchak (synchronously) - MS.
EK Ligachev listening - CU. Responsible EK Ligachev (synchronous) - CU. Anatoly Sobchak listening - MS.
M. Kalinin gives award Voroshilov - MS.
M. Kalinin gives award Gromyko - MS.
M. Kalinin gives award Khrushchev - MS.
Brezhnev kissing Voroshilov - CU. Brezhnev kissing Suslov - CU., PNRM. By plane descends Livkov - MS. The train leaves the representative of Hungary Janos Kadar - MS.
By plane descends GDR State Council Chairman A. Honecker - MS.
By plane descends Chairman of the Presidium of the MPR Tsedenbal - MS.
Romanian President N.Chaushesku greets welcomers - MS.
By plane descends foreign guest - MS.
Go Brezhnev and others - LS., PNRM. Brezhnev presenting the award - CU., MS. The man says (synchronously) - CU. Said another man (synchronous) - MS.
Rally at Gorky Park - LS. Said Vladimir Zhirinovsky (synchronous) - CU. The deputy lieutenant N. (synchronous) - CU. Says N. Travkin (synchronous) - CU. Emblem of Russia - MS., PNRM. Are carrying the flag of Russia - MS., PNRM. Acts Garry Kasparov (synchronous) - MS., PNRM. Says N. Travkin (synchronous) - CU., MS., PNRM. Internal forces - LS., PNRM. The parade of athletes at the stadium "Dinamo» - LS. Wooden Lenin Mausoleum - MS.
Members of the government - MS.
Worker, peasant - CU., MS.
A woman looks at the bell - CU. Fall crosses from churches - MS.
Falls from the church bell - MS.
Workers blast furnace - MS.
Slogans, blast furnace - CU. Molotov, Mikoyan and Beria - CU. Khrushchev presented bread and salt - MS.
Grishin handed banner - MS. The inscription "200 000» - MS. Tank, the slogan - MS., PNRM. Fountain "Friendship of Peoples", Exhibition - MS., LS. Politburo member Yevgeny Primakov and others - MS. Politburo member VI Vorotnikov and A. Prokofiev, the Communist Party ideologue Anatoly Lukyanov and deputy VA Medvedev, GA Yagodin other - MS.
Gorbachev at ENEA - CU., PNRM. Said Morozova (synchronous) - CU., Departure, Hitting, LS., PNRM. Go Khrushchev, Brezhnev and other - MS.
Khrushchev cuts the ribbon on the monument - MS., PNRM. The opening of the monument to Marx - LS. Chairperson of the Supreme Soviet Boris Yeltsin (synchronous) - MS., CU., PNRM., Hit a Gorbachev. Band sings KVN (soundtrack) - MS., PNRM., Departure. Says Koltsov - MS., Hitting, CU. On the mausoleum members of the government - CU., Departure. May 1st, the demonstration - MS., Departure, LS., Hitting. Mikhail Gorbachev, the oath (synchronous) - LS., Departure, MS., Hitting. Woman says (synchronously) - CU., PNRM. Gorbachev speaks (synchronous) - MS.
May 1st, the demonstration - LS., Hitting. 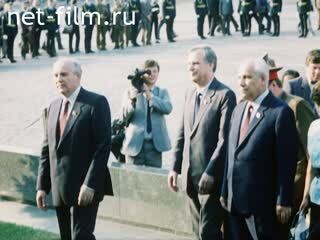 Gorbachev, the Soviet Prime Minister Nikolai I.Ryzhkov, A. Lukyanov on the mausoleum - CU., Departure. May 1st, the demonstration - MS., Departure. Gorbachev speaks (synchronous) - CU. Brezhnev gives Gorbachev's Order of Lenin - MS., Departure. Said Mikhail Gorbachev - MS., CU. Gorbachev and Ryzhkov on the mausoleum - CU. Gorbachev says (synchronously) - MS., CU., Departure. Andreev says (synchronously) - CU., MS., PNRM. Acts Mikhail Gorbachev (synchronously) - CU. May 1st, the demonstration - LS., PNRM. E. Shevardnadze on the mausoleum - CU. EK Ligachev on the mausoleum - CU. Gorbachev and Ryzhkov Mausoleum - MS. The man says (synchronously) - CU., Hitting. Acts Yeltsin (synchronous) - MS., CU. Yeltsin pass through the hall - CU., PNRM. Communist Party member I. Polozkov goes to the podium - LS., PNRM. Mikhail Gorbachev, PNRM. a bas-relief of Lenin to Gorbachev - CU. Acts I. Polozkov (synchronous) - CU. Laying a wreath at the Mausoleum - LS. Are members of the government - MS., PNRM. (With us). Palace Square in Leningrad - MS. Refugees from the Kremlin - MS., PNRM. Monument to Lenin - CU., PNRM. Mikhail Gorbachev among the people - LS., PNRM., MS., CU. The boy with no legs dancing - MS.
Woman crying - CU., PNRM.